Last night after work I went outside to do very different types of exercise. First was a hard mode attempt at the Bender. The stiff legged leg raises are so tough for me because of both my poor hip flexibility and very long legs. I BARELY got a 7th rep. I then tried again to do a better elbow planche on top of the pull up bar. After an embarrassingly bad bar over I got my body straighter but quickly tipped forward and flipped over the bar. In a way it was good that I tipped over, it helped me get over the apprehension of what would happen if I did so. I was worried that I could possibly lose my grip and fall off the bar but I was able to hold on easily without crashing to terra firma. Finally I messed around with my smaller, 200 lb tire. I wanted to see if I could pick it off the ground completely. Doing so involved first leveraging the tire on my thighs, grabbing the inner bead of the tire and leaning back. I got the tire elevated and was even able to get it above parallel with the ground. I thought it would be cool if somehow I could flip it up and over my head but doing so would require more strength/power than I currently possess. 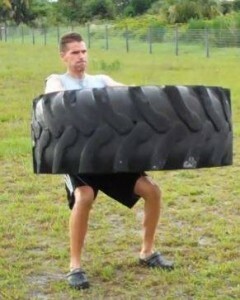 I would like to try this same move with the bigger 300 pound tire sometime. The size and shape of these tires makes lifting them entirely different than trying to pull the same weight when it is hung off a nice and tidy barbell.